Nothing kills a campsite buzz like a tent with too many poles and too little instruction. Enter the Coleman Instant Tent 4, a four-person tent that sets up in less than a minute. The tent is made using an innovative one-piece design, with poles that come pre-attached to the tent. That means there’s no frustrating assembly and no parts to lose. Simply unfold the tent, spread out the fabric, extend the poles, and click and lock. The only thing easier is rolling out your bag and sleeping in the open. Made of heavy-duty 150D polyester taffeta, the Instant Tent 4 is every bit as sturdy as its traditional counterparts. 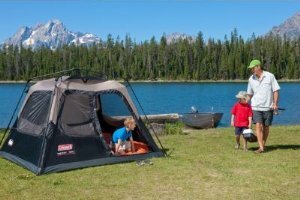 The tent is outfitted with Coleman’s exclusive WeatherTec system, a series of technical features intended to protect you from inclement weather and nasty storms. WeatherTec tents are built with a coated polyester fabric combined with anti-wicking thread, webbing, and zippers, all designed to keep you dry when the rain comes down. The tent’s welded waterproof floor and inverted floor seams, meanwhile, dramatically increase the water resistance by hiding the needle holes inside the tent and away from the elements. The tent is also fully taped, eliminating the need for a separate rainfly. Add in a strong, wind-responsive frame and you have a shelter that performs like a brick house during a storm. In fact, Coleman is so confident in its WeatherTec system that it exposes its WeatherTec tents to a rain room that simulates nasty downpours, and to a wind machine capable of blowing hurricane force gusts. The results? Even after the tests, Coleman guarantees its WeatherTec tents will keep you dry. 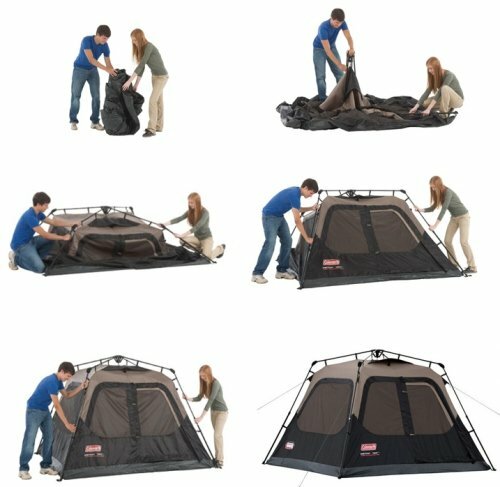 The 4-Person Instant Tent, which sleeps up to four people in its 8-by-7-foot footprint, stands 59 inches tall in the center and includes room for one queen airbed. The tent weighs 35.55 pounds and carries a limited one-year manufacturer’s warranty.